Erin Miller | Galion Inquirer Cameron Payne picked up his third win of the season on Friday as the Tigers played host to the visiting Plymouth Big Red. Payne scattered five hits over four innings as Galion marched around the bases to the tune of a 20-5 victory over their visitors. 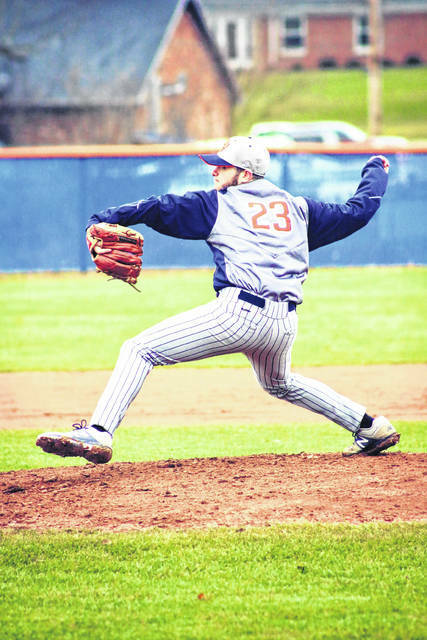 GALION — The weather has been far from cooperative so far this spring but the Galion Tigers baseball team was able to squeeze in a home, non-conference contest with the visiting Plymouth Big Red on Friday, April 6. Despite having to dawn jackets and huddle around heaters in the dugout, the Tigers offense would once again explode, leading Galion to the 20-5 victory over the Big Red. With the victory, Galion improves to 4-1 overall on the season. Galion would jump out to a 4-0 lead after the first inning but Plymouth would plate four in the top of the second to momentarily tie the ballgame. The Tigers unleased seven runs in the home half of the second to distance themselves from the visitors as Plymouth managed just one more run in the top of the third. Cameron Payne would earn his third victory of the season Friday, giving the home team four strong innings of five hit baseball. Payne gave up five runs (four earned) while walking three and striking out three. Carter Keinath worked the final inning of the shortened contest, striking out two Plymouth hitters while throwing just 10 pitches. Payne scored a run to help his winning cause and Keinath finished with a monster day at the plate, recording two singles, a double, three runs batted in and two runs scored. In the offensive onslaught, Galion would have four additional players earn multi-hit games against the Big Red’s pitching staff. Ryan Utz finished the game with a pair of singles and a triple while also driving in three runs and scoring twice. Clay Karnes also had himself a three-hit day, all singles, while plating two teammates and scoring two runs. Mitch Dyer belted a single, a triple and scored a run and Spencer Keller knocked a single, a double, scored three times, drove in a run and stole a base. Other Tigers’ stats from Friday’s win were: Ethan Pigg- 2R, RBI, SB; Matthew McMullen- 1B, R; Wilson Frankhouse- 1B, RBI, R; Markis Lawson- 1B, 3R, RBI; Troy Manring- RBI, R and Kaleb Harsh- 1B, 2RBI; Team- 20R, 16H, E and 7 left on base. Plymouth managed their five runs on five hits, committed three errors in the field of play and stranded three runners on the base path. Weather permitting, Galion will head to Marion on Tuesday, April 10 to hopefully open their Mid-Ohio Athletic Conference season against the hosting Harding Presidents. On Wednesday, the Presidents are set to travel to town for a meeting with the Tigers. Galion will then be on the road again on Friday, April 13 for a non-conference clash with the Mansfield Senior Tygers before hosting a doubleheader against MOAC foe, the Buckeye Valley Barons on Saturday. https://www.galioninquirer.com/wp-content/uploads/sites/38/2018/04/web1_Cameron-Payne-1.jpgErin Miller | Galion Inquirer Cameron Payne picked up his third win of the season on Friday as the Tigers played host to the visiting Plymouth Big Red. Payne scattered five hits over four innings as Galion marched around the bases to the tune of a 20-5 victory over their visitors.